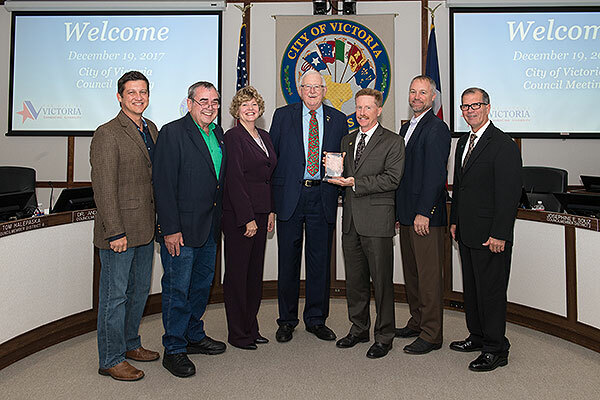 UHV President Vic Morgan, center, presents the 2016-2017 Community Partnership Award to Victoria City Council members and City Manager Charmelle Garrett, third from left, at Tuesday’s council meeting. Council members present to accept the award were, left to right, Dr. Andrew Young, Tom Halepaska, Mayor Paul Polasek, Jeff Bauknight and Rafael DeLaGarza. The award initially was announced at the Nov. 7 UHV President’s Annual Report & Excellence Awards event, but Garrett and the council members were unable to attend because of a council meeting. Morgan gave the award to Garrett and the council based on their long history of partnering with UHV, including the council’s unanimous vote to support a project that will allow UHV to enhance Ben Wilson Street in front of the university.